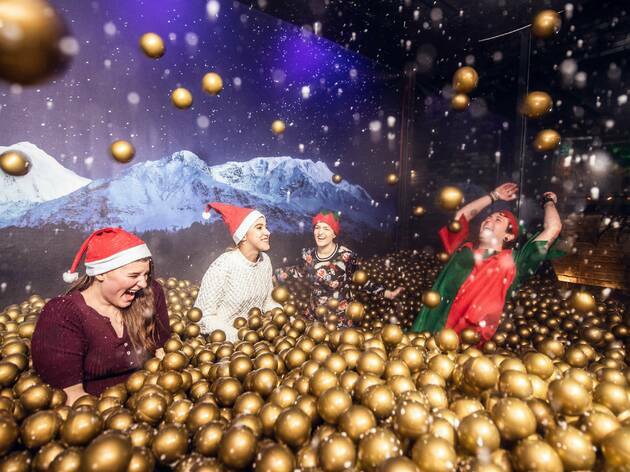 Evergreen adult playground Ballie Ballerson is guaranteeing you a white (well, gold) Christmas at their new ball pit in Shoreditch. Rather than waiting around for this year’s light sprinkling of snow, which inevitably turns into a slushy slip ’n‘ slide within days anyway, you can get balls deep in some of their fluffy stuff. Set against the backdrop of moonlit snow-capped mountains, you’ll be invited to frolick with friends underneath the snow machine while good ol’ Ballie provides music, Christmas cocktails and free festive face-painting. The only thing that could improve this experience would be the addition of Golden Balls himself, swimming amongst those sparkly spheres. Ballie Ballerson’s ‘Snow Globe Pit’ will be open from Dec 10-Jan 15 2019. 97-113 Curtain Road, EC2A 3BS. Looking for somewhere a bit… cosier? Kick back at one of these winter pop-ups.